We treasure the memories we have of you. This day is remembered and quietly kept. No words are needed. We shall never forget. Forever loved and always remembered. John was born in 1868 in Suffolk, England, the second oldest of a large family. He joined the Royal Marine's at the age of sixteen, was assigned to the Nelson Battleship and travelled in the Middle East. He came to Montreal, Canada, where, deciding to try civilian life, he had to pay the Navy to leave the service. He found work as a caretaker for a well-to-do lady in Westmount, Mount Royal, Montreal. His job was to take care of the horses and to drive the lady around in her carriage. Margaret Reid was born in 1864 in Edinburgh, Scotland. She came to Montreal and found work as a children's nursemaid. John and Margaret were married and lived on the estate where John was employed. In 1903, they came to Hart's Lake S.W. 6-17-18W and he worked as a farm­ hand in the area. There were many hardships, one being a fire that came in the night and they had to spend the night by the creek. Later, they purchased N. W. 7-17 -18W, built a log house and continued to farm. area in Montreal where he had worked. He was a trustee at Westmount School for several years. They were both active in the district. He retired and Malcolm took over the home farm. Later, John sold out and moved to British Columbia. Margaret passed away in 1937 and John in 1958. They had three children: Seggie, born in 1901, attended school at Westmount and was one of the first pupils. One morning when she came to school there was only a pile of ashes and a bit of smoke. Seggie moved to British Columbia. She later married and resides in Deming, Washington. Charlie was born in the Westmount district and at­ tended Westmount School. He worked on the home farm as well as in southern Saskatchewan and various other places. He came back to Erickson, married, and moved to British Columbia, where he now resides. Malcolm was born at Westmount and attended school there. He worked on the home farm. He later married . and moved to Biggar, Saskatchewan, where he still resides. Sidney was born October 21, 1881, at Lincoln County, England. He emigrated to Canada in the early 1900's. His parents and family came to Foam Lake, Saskatchewan. He came to Erickson in 1908. 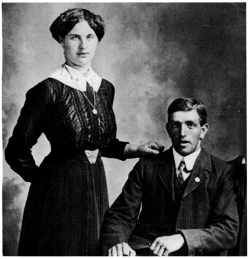 He married Olga Danielsen and they lived here till 1911 when they moved to Foam Lake and farmed there. Later coming to Angusville and worked on the railroad, then to Erickson where he was section foreman. His mother, in ill health, came to stay with them and she passed away in 1917. In 1923, Olga and family moved to Scandinavia. Olga ran the store there. Sidney stayed in Erickson and continued on the C.N.R. Later he was at Rorketon, The Pas, Hallboro and Woodside. Then they moved to Winnipeg. Sid retired after 43 years with C.N.R. They had eight children; Elsie born December 12, 1909 at Erickson and was educated at Erickson. She worked at housework duties. On May 29, 1934, Elsie married Fred Christopherson. (refer to Christopherson, Fred and Elsie). Eric was born July, 1911 at Erickson and attended Erickson school. He worked at various jobs. He married Ethel Jury of Minnedosa, Manitoba. Ethel taught school before she married. They had a hardware store at Shoal Lake. They moved to Keyes, Manitoba and operated a grocery store, also had a store at Morden, Manitoba. He worked for awhile at Ashdown's in Winnipeg. They retired and moved to Minnedosa. They have two children; Kenneth and Lois. Kenneth was married and had three children. He passed away in 1981. Lois was married and they have a son Paul. Charlie born January 21, 1913 at Foam Lake, Saskatchewan. He got his education at Erickson. He lived at Scandinavia, then Winnipeg where he worked as a janitor. He is now retired.